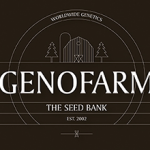 Genofarm has more than 15 years breeding experience in the hemp industry. Their genetics are sourced and selected from the purest strains to ensure the best quality. They work with high end hemp experts to keep up with a knowledgeable and demanding public. To ensure high end quality, They look for well structured varieties that have special rarities and colourful polychromes. They constantly test their genetics to ensure they function in extreme conditions with high and low temperatures.Their seeds are made up from a truly composite gene pool which provides stable varieties of land race strains, pure bred plants, elite clones and hybrids.